The Community Foundation’s competitive application cycle is now closed. Information about the next cycle will be posted in the spring of 2019. If you have questions about the competitive application process, please contact Thayer Talbott at 860.347.0025 or Thayer@MiddlesexCountyCF.org. Congratulations on your award. Your grant from the Community Foundation of Middlesex County (CFMC) reflects on your hard work and dedication, and the news should be shared with your community. The downloadable 2019 CFMC Grantee Communications Kit provides guidance on the best ways to broadcast your achievements and outlines the Community Foundation’s expectations about spreading the word about your grant project. “Community Foundation of Middlesex County represents local people, giving locally to make an impact on the lives of others – not just for today, but forever. 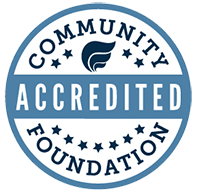 The Community Foundation works with charitably-minded individuals and organizations to build permanent endowments and other charitable funds. These funds support local nonprofit organizations through effective grant making to address community needs. We would appreciate any copies of newspaper articles or announcements in which you have acknowledged support from our Community Foundation. We would also love to receive quality photographs and videos by email of your program for our files and possible use in our annual report and newsletters. CFMC logo is to be used in its entirety. CFMC logo shall not be cropped, recolored or altered in any manner. Requests for alternative uses of the CFMC logo shall be directed to Thayer Talbott at 860.347.0025 ext. 203 or Thayer@MiddlesexCountyCF.org. Nonprofits considering submitting an application in the current competitive grant cycle need to ensure all prior grant evaluations have been submitted. If you are unsure of your grant evaluation status or if your program or project is incomplete and you have questions regarding your grant evaluation, email or call Thayer Talbott, Vice President, Programs & Operations, at 860.347.0025 ext. 203.